When you work from the ground in groundwork, lunging, work in hand or liberty, you can literally keep an eye on the eye. 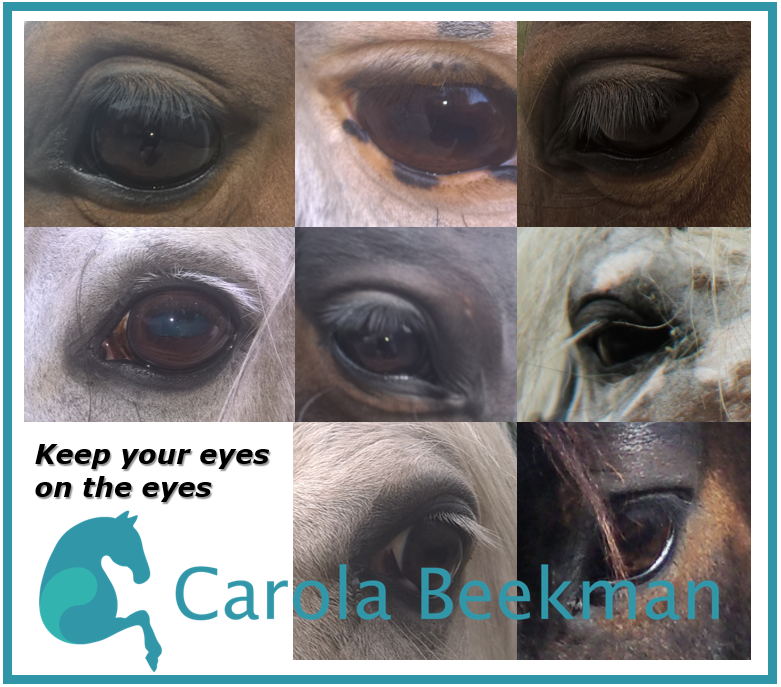 The eye of your horse will let you know if he/she is “with you” or his/her thoughts have wondered of. When your horse is with you, it will willingly respond to your energy, body language, thoughts and cues with lightness and concentration. A connection which feels like a nice conversation or playing a fun game with a good friend. – your horse is obedient, but you can tell he/she is only giving you the exercise. You’ll need bigger cues and aids, maybe pressure in order to get the requested exercise. Lack of fun and expression will show. I call this the robot mode. – your horse becomes distracted and doesn’t meet your requests anymore. Focussing on other input from the environment, not much or no focus on you. You’ll need big aids, a lot of pressure to get the horse to do what you ask. Your horse is against the pressure or ignores it. You will have to work harder, but the more you do, the less your horse will offer. When you keep an eye on the eye, you have a barometer that will tell you about the degree focus of your horse. When you see the focus on you, praise and reward with happy, greatful thoughts, words and rewards with a break, a scratch a goodie, ect. When the focus is on something else, gently try to guide the focus back to you by giving a little puzzle to solve. This could be anything, a halt, a circle a change of direction- away from what your horse was focussing on, works well often. When your horse has a concern about something, just tell it is perfectly save and you, as a leader, are taking care of safety always to the best of your ability. Another concept is to create an imaginary tunnel over your arena. Like a tunnel through an aquarium at the zoo. Imagine to make the glass a bit blurry, so the visual and auditory input becomes blurry and soft. It will become easier to work with your horse, together in that tunnel. But most of all: BE THE EXAMPLE. Be a leader in calmness, focus and clear communication. Make it fun and challenging! I invite you to leave your experiences, comments, additional information and questions below. Together we know so much more! Let’s help each other to become the best trainers we can be. Please let me know how I can coach you on your personal journey live in lessons, during a clinic or online with Equestrian Image coaching I designed especially for all you out there in all corners of the world!